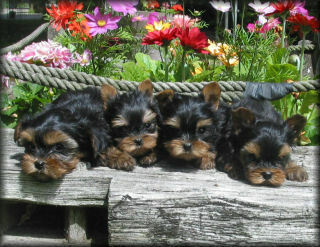 YORKIE BREEDER LOCATED IN NORTHEAST OHIO. I HAVE AVAILABLE YORKIE PUPPIES NOW. YORKIES AT SPRINGLAKE ARE BRED FIRST AND FOREMOST FOR EXCEPTIONAL TEMPERAMENT, HEALTH AND MAGNIFICENT BEAUTY. ALL PUPPIES ARE 100% GUARANTEED. EVERY PUPPY IS CLOSELY EXAMINED AND PROPERLY IMMUNIZED BEFORE ELIGIBLE FOR SALE. SPRINGLAKE APPLIES OVER 38 YEARS OF RESPONSIBLE BREEDING EXPERIENCE. ALL YORKIES ARE RAISED WITH THE UTMOST SPECIAL CARE AND LOVE THAT EVERY FAMILY DESERVES. LEARN MORE ABOUT THE BREED TO DETERMINE IF YORKIES ARE A GOOD FIT FOR YOU AND YOUR HOME.